Our Student Ambassador program consists of outstanding undergraduate students who promote pride and develop awareness of the HLCFPA and its academic programs. Undergraduate Student Ambassadors coordinate activities with prospective students, parents, alumni and the general public. They also give tours of their educational department to prospective students interested in majoring in fine and performing arts. 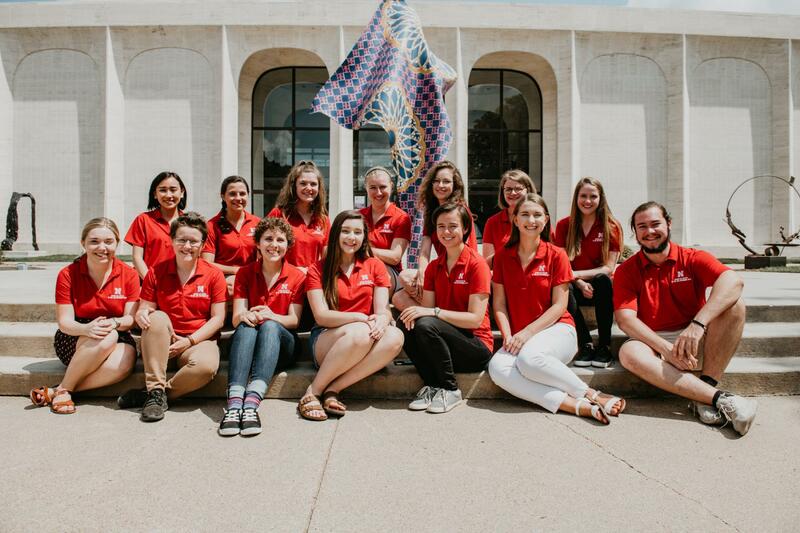 Ambassadors volunteer their time and talents at special events including: Red Letter Days, Husker Weekdays, The Big Red Road Show, GKSOM Music Performances, JCSTF Productions and DAAH Art Exhibitions. Contact Allison Casey, Director of Recruitment, at acasey5@unl.edu if you’re interested in becoming an ambassador. Learn about UNLArts Majors & Minors; meet our Faculty, Staff, & Students; and tour our Facilities on campus. Not from Lincoln? Don’t worry, we’ll bring UNLArts to you! Walk through booths to explore the academic and student life possibilities at NEBRASKA! If you live in Chicago, Denver, or the Twin Cities, catch the bus and come see what UNLArts has to offer. For questions about our Ambassadors program, please e-mail unlarts@unl.edu or call (402) 472-9339.